rec. January-February 2014, RLU Records, Cincinnati, Ohio, USA. The history of music is filled with many fascinating stories, some purely anecdotal, some fictional, some the product of fertile imaginations. Then there are those baffling instances in which a series of real-life episodes in the life of a musician stuns one with its inexplicable details. Among such stories none is quite as fascinating as that of a young Italian boy who, barely in his teens, poor, given a rudimentary musical education and a cello by a relative, in the space of two years masters the unwieldy instrument. He begins to concertise, has to sell his cello to put food on his table, meets Franz Liszt who gives him a new instrument and then goes on to become the greatest cellist of the ninteenth century. His name was Alfredo Piatti. I was not familiar with Piatti's music before listening to this Navona recording of his 12 Caprices for Solo Cello, Op. 25 by the young Venezuelan cellist Carmine Miranda. He wrote several dozen compositions for his instrument, many of them the sort of pièces d’occasion that populated nineteenth century European salons, mostly in combinations with piano or with other string instruments. There are just a few larger works by the Italian virtuoso-composer among them some concertos that he wrote to feature himself as soloist. Then we come to the twelve Caprices. Ranging in length from little over one minute to six minutes plus, the dozen caprices are a significant contribution to the solo cello literature by a rather obscure 19th century romantic whose time came and went ... and should now return. These are not merely technical exercises, even though each and every one presents a daunting difficulty of its own that must be surmounted before music can be made. Carmine Miranda not merely overcomes the technical hurdles in this musical mine-field but saunters through it with aplomb and musicality. In the fast and furious opening Caprice, marked Allegro quasi presto, Miranda obeys the marking set by Piatti, only to follow it with the cantilena of the second Caprice. This is marked Andante religioso, in which the cellist mines the depth of the music with a lustrous singing tone which he again and again obtains from his American-made instrument by Chicago luthier William Whedbee. We proceed from memorable moment to memorable moment. Miranda adds this second album to his calling-card debut, the 2012 Centaur release of the J.S. Bach Six Suites for unaccompanied cello. The packaging is nicely done and comes complete with insightful programme notes by Miranda himself, who also produced the recording. The crystal-clear engineering is by Charles Peck. There are alterative versions of the Piatti Caprices by Danish cellist Erling Blöndal Bengtsson (Danacord), Chinese cellist Wen or Korea’s Soo Bae (Naxos 8570782) but I have not heard these. 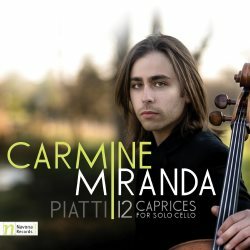 Alongside his recording of Bach’s Six Suites Miranda announces his arrival as a cellist of immense musicality and polished technique. In the case of this Piatti disc he brings to the attention of the musical public a dozen gems that richly deserve to be heard as part of the standard concert repertoire for what I consider the loveliest of all string instruments.